Earlier this month, we had the pleasure of hosting the 2010 isee User Conference in Providence, Rhode Island. During this amazing gathering of isee customers, partners, friends, and iThink/STELLA enthusiasts, we learned about the important work that is being done applying Systems Thinking to solve real-world problems, shared ideas, and made connections with one another. For two and a half days, I saw participants immersed in keynote presentations, breakout sessions, and hands-on workshops. 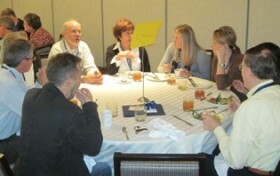 As important, however, were the less structured round table discussions, poster presentations, and social activities. Everywhere I looked, folks were engaged in conversation and connecting with one another. Even better, I knew that many of those connections would continue to be fostered and developed well after the conference was over. One of the highlights of the conference for me was listening to the story that Steve Peterson and Paul Bothwell told about using Systems Thinking and dynamic modeling to help communities in high-violence Boston neighborhoods. What made this project different from other attempts to research and solve the youth violence problem in Boston was that it engaged “the community” in the development of the model. From the get go, they included youth in the modeling process. Gang members, in particular, turned out to be an important missing link to understanding violence and the dynamic system behavior. Both Steve and Paul described some of the harsher realities of working with young people whose family members and friends were victims of violence. The modeling process actually helped community members to articulate the “slippery slope dynamics” that move youth through the different stocks to gang involvement. If you have a chance, I highly recommend listening to the audio recording! 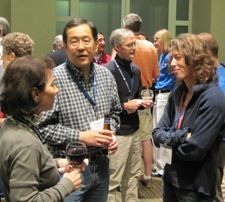 Having time to interact with other participants was an important part of the conference experience. It was wonderful to see the excitement and energy that is created when Systems Thinkers have an opportunity to connect with one another. The cross fertilization that occurs so naturally between field experts, modelers, and educators was inspiring. Please stay connected and let us know if there are other ways in which we can foster our growing community of STELLA and iThink modelers!